Which pears are the sweetest? An apple a day keeps the doctor away, but what about a pear? They may not be very popular today, but they have been esteemed throughout history. It was called “a gift of the gods” in The Odyssey, one of the two legendary Greek poems by Homer, who lived during the 7th to 8th century BC. Before that – in 5,000 BC – a famous Chinese diplomat named Feng Li quit his prestigious position just so he could cultivate this fruit full-time. Nowadays, we’re more likely to encounter them vicariously, through the lyrics of a Christmas carol rather than in our own meals. Why are apples more popular than pears? 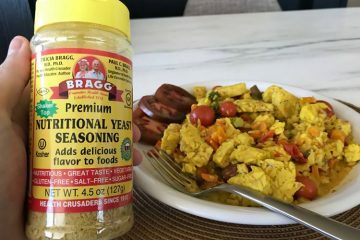 It’s probably because of perishability and seasonality, not an inferior flavor. Pears are one of the few fruits that ripen best post-harvest. Otherwise they’re too mushy. 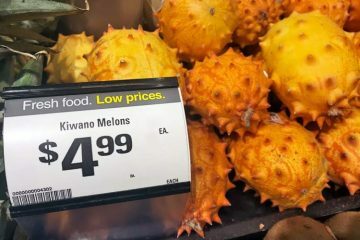 Unfortunately, their ripening process can be unpredictable. Their oblong shape can be hard to cut and eat. The structure of an apple is more conducive to on-the-go eating. With the exception of Honeycrisp, their shelf-life when ripe can be a month or more if refrigerated. A pear is ripe for only a matter of days. Then the skin gets brown and the pulp gets mushy. Even though they’re much less popular, the nutritional value of pear fruit vs. apple is quite similar. In fact, pears may even offer some advantages when it comes to weight loss, anti-inflammatory properties, and other things which are good for you. Just like apples, pears can serve as a low calorie and energy boosting snack. The amount of sugar in a pear vs. apple is identical; 10g of sugar per 100g (3.5 oz) serving. While the amount can vary slightly be variety and ripeness, for all intents and purposes they’re the same. An average medium apple (182g) has 4.4g of fiber while a similar sized pear (178g) has 6g – that’s about 36% more fiber. Aside from the fact that women and men need a minimum of 38 and 25 grams per day, respectively, the more you eat, the fuller you will feel. 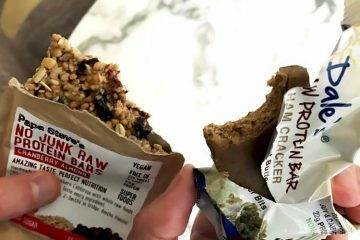 A major benefit if you’re trying to lose weight and curb those snack cravings! As for the fiber itself, that has zero calories – it passes through the human body undigested. Which pears have the most fiber? Since the different types of pears vary in size, the best way to compare their fiber content is by using an equal weight comparison of each. For 100g or 3.5 oz serving, Comice, Concorde, Seckel and Forelle have 2.9g, Red d’Anjou and Bosc have 3.0g, Green d’Anjou and Bartlett/Williams have 3.1g, and Chinese or Asian pears have 3.6g. 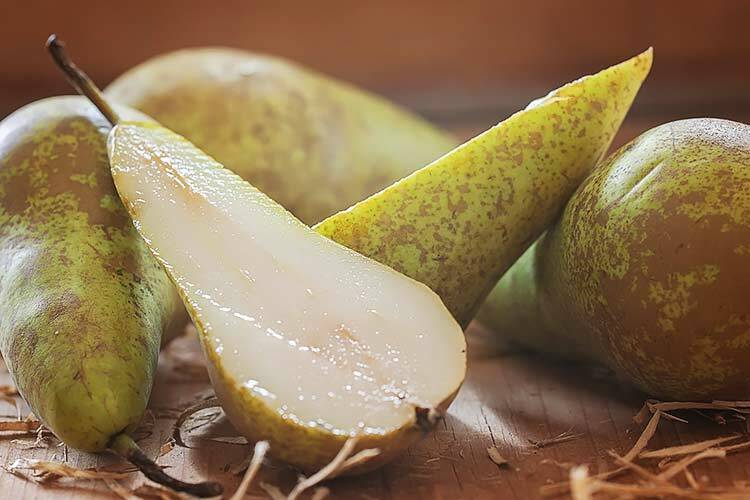 All varieties fall between 2.9 and 3.1g except for Asian pears, which have the most fiber – over 16% more than 2nd place. 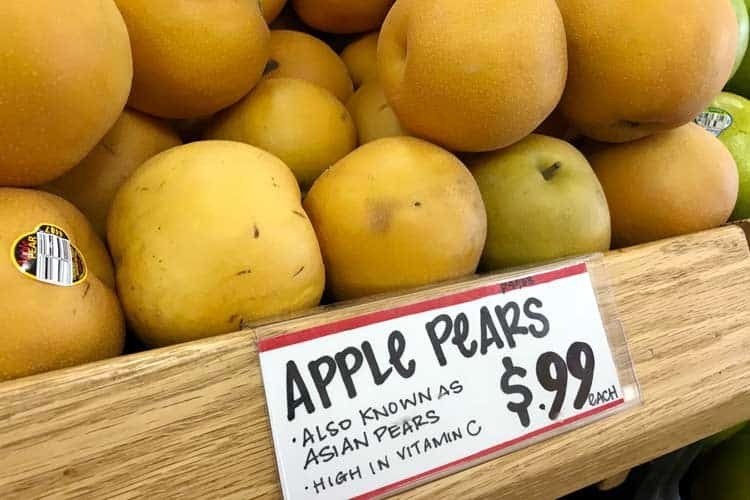 There is no difference between an apple pear vs. Asian pear. Both are the same species, Pyrus pyrifolia. In the United States they’re often called apple pears since their shape resembles one. 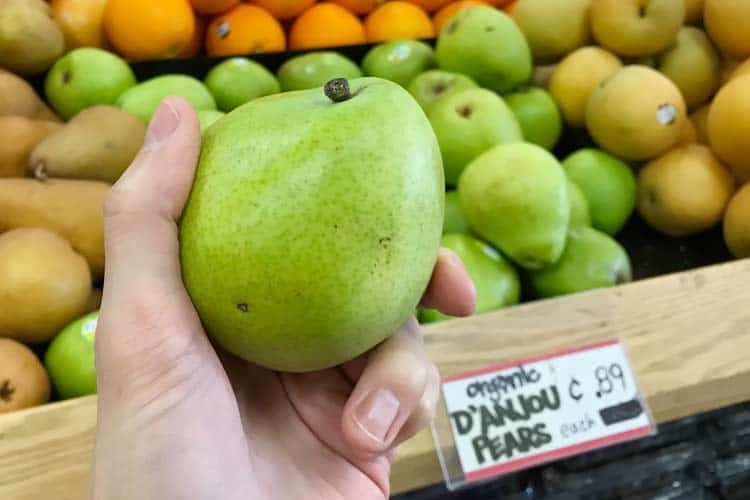 In China they’re called the Chinese pear, in Japan it’s the Japanese pear, and elsewhere it’s called Nashi apple pear, sand pear, and bapple, among other names. They’re all the same thing. Fructose gets a lot of flak because of high-fructose corn syrup, but that’s quite different than natural forms which are arguably better for you versus regular sugar (sucrose). 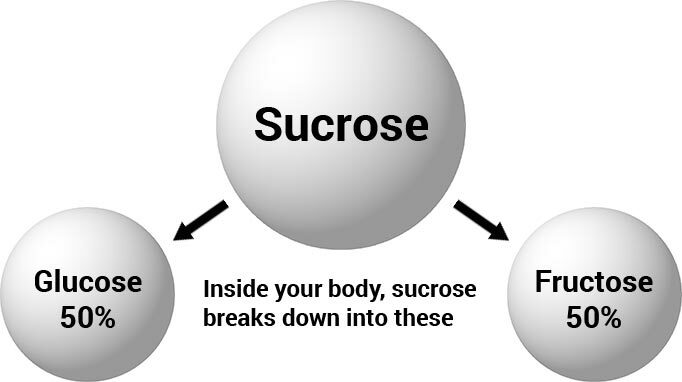 Every cell in the body can process glucose, but only the liver can process fructose and deliver it’s energy. That can act as a “speed limit” in how fast fructose can raise blood sugar, relative to sucrose and glucose. This is why fruit-sweetened foods have long been recommended for both type 1 and 2 diabetes. Not as an ideal, but as a less naughty sweetener vs. sucrose or glucose. 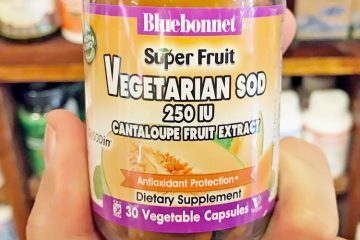 In the case of this fruit, since it’s packed with fiber, the digestion of fructose is slowed. This results in it having a relatively low impact on blood sugar levels. According to The University of Sydney, the glycemic index of fresh pears is only 33 to 41, for a 120g (4.2 oz) serving size. This compares closely with raw apples, which range from 28 to 44. If you search the nearly 30 million pieces of medical literature in the PubMed database, you will only find about 30 human trials involving pears. It’s expensive research and as you can imagine, there isn’t much financial motivation to bankroll human studies on this fruit. That said, there is one on weight loss. We have a university in Brazil to thank for that. 49 overweight women participated (BMI of 25+). All were 30-50 years old and non-smokers. Dietitian instructed them how to maintain a diet where 55% of calories were from carbs, 15% from protein, and 30% from fat. The women were randomized into 3 groups. Each received cookies/patties made of dried apples, dried pears, or oats. Each of these had the same amount of fiber and calories. These cookies/patties were used as supplements, taken 3x per day for 10 weeks. Weight was unchanged in the oat group, while those eating the fruit experienced a statistically significant reduction; -0.93 kg (-2 lbs) for the apple and -0.84 (-1.9 lbs) for the pear group. They covered about 5% of the stomachs in the control group (no treatments given). They covered about 12% of the stomachs in the rats pre-treated with chlorogenic acid (an antioxidant in coffee). 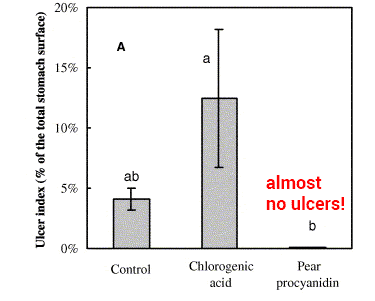 Almost no ulcers were formed in the rats which ate pear beforehand. Are pears high in vitamin C? Not really. The average medium pear weighing 6.3 oz (178g) contains 7.7 mg of vitamin C, which is 12% of the daily value for adults in the US. While this is not a high amount, it’s the same amount of vitamin C that apples have on an equal-weight comparison. Canned pears are still healthy but they will have less vitamin C. The heat of pasteurization during the canning process destroys some. Poached pears will also have less. The healthiest way to eat a pear is raw, with the skin left on. 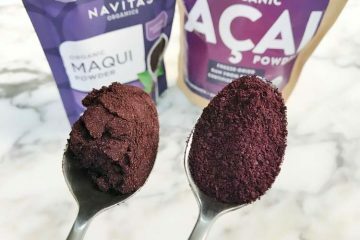 If you want a high natural source of vitamin C, then get a bag of freeze-dried camu camu powder. When it comes to total antioxidant activity measured, apples are healthier than pears. The ORAC values for 100g of an average apple with skin intact is 3,049, compared to 1,746 for red Anjou pears and 2,201 for green pears. However when dried, pears beat apples. The antioxidant content in pears holds up well to drying. With 40% moisture, dried pears have an ORAC of 9,496 versus 6,681 for dried apples. The reason both are higher than fresh is because most of the water has been removed and hence, the nutrients are concentrated. The healthiest type of pear for antioxidants will be those with green skin, such as green d’Anjou. Make sure you eat the skin, because that’s the part with the highest antioxidant content. Does pear juice prevent hangover? A South Korean university conducted a human clinical trial to measure the effects of Korean pear juice on hangovers from drinking. Remember there is no difference between an Asian pear vs. Korean pear. Both are the same thing. 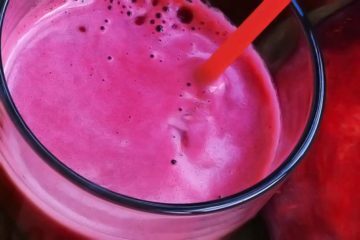 Whatever you want to call it, the researchers made a juice with it and tested it as a preventive remedy. 14 healthy young men participated. They were split into two groups; one received 200 mL (6.8 oz) of pear juice, the other received a placebo version. 30 minutes later, they all drank 540 mL (18 oz) of spirits which had a 20.1% alcohol concentration. Drink type wasn’t specified but beer and wine are much lower, so presumably this was vodka, gin, rum or whiskey that was diluted. For 15 hours following the alcohol, blood and urine samples were collected from the men at 9 different times. As seen in chart A for ethanol (alcohol) levels, those who drank the Korean pear juice beforehand had a lower blood alcohol content (BAC) despite drinking the same amount! That last part – translated to plain English – is that those with a certain gene seem to be helped the most. Despite all the hatin’ on them these days, carbs (sugars) do serve a very important role in physical fitness. After an intense bodybuilding session or strenuous strength training, during the 60 minutes that follows – which is hailed as the golden hour – your muscles need sugar badly. They are in what’s called a catabolic or breaking down state and need their energy stores replenished. If you don’t get sugar and protein post-workout, your muscles won’t benefit as much. At least if you’re trying to bulk up. During that 30-60 minute period post work-out, you actually want a glycemic spike, to promote glycogen synthesis, which supports the muscle recovery and growth. Plus, having a moderate amount of sugar during strenuous workouts can boost performance. In a clinical trial involving 20 male athletes who cycled for 75 km (47 miles), those who consumed pears during the event experienced 3.3% faster cycling times versus those on water alone. There was also a reduction in cortisol, IL-10, and total leukocytes, all of which point to a healthy workout with less oxidative stress. 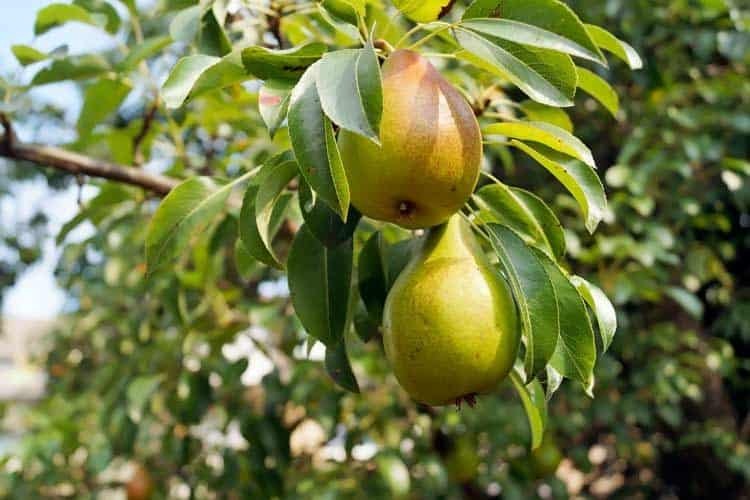 What vitamins and minerals do pears have? As with most other pome fruits, vitamin C is the only one in a noteworthy amount. There is also a small amount of vitamin B6. When it comes to essential minerals, potassium is the most abundant in pears. One medium fruit will provide around 200 mg, which is only 5% of the daily value but still a decent amount given the small serving size. Magnesium is next at 3%. It’s not the reason pears are theorized to help hangovers and exercise performance, but the potassium they contain is an added boost to both scenarios – it’s an electrolyte needed for proper hydration. Sugary drinks – including seemingly “healthy” juices – are contributors to the obesity epidemic among American children. Many parents don’t realize that 8 oz. of 100% apple juice contain 24g of sugar, which is barely better than the same amount of Coca-Cola, with 26g of sugar. Welch’s grape juice is worse than both, at 36g! No wonder our kids are getting fat. While the solution is to drink less of these sugary drinks, we can’t deprive our kids entirely, right? So which are the healthiest juices to give them? The Department of Pediatrics at Maimonides Medical Center in New York conducted a clinical trial involving 104 babies, toddlers, and young children. There were in three groups; ages 1, 3, and 5 years old. How well (or not) each juice was absorbed got measured using breath hydrogen excretion (BH2) readings. The higher the BH2 levels, the less sugar there was being metabolized. In other words, less sugar was being absorbed with the pear juice. The reason for this was the sorbitol and the higher concentrations of fructose. This benefit was highest at age 1, lower at age 3, and non-existent at age 5. In short, this means that with babies and toddlers, foods and juices made with pears may be more glycemic friendly. Even when their nutrition facts show the same amount of total sugar. Since all varieties have very similar nutritional values, the healthiest pear is whichever one works best for your diet and needs. The Bosc, Comice, Concord, and Seckel are considered to be the sweetest tasting pears. In fact, another name for Seckel are sugar pears. Their small size works best for salads. 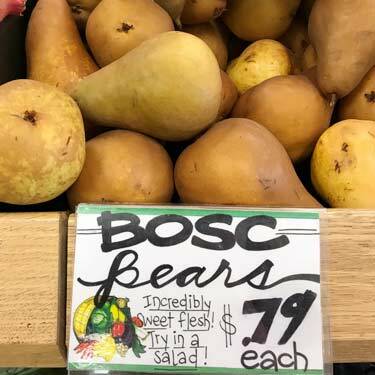 Among those more readily available and suitable for snacking, the Bosc is a sweet and juicy choice. According to the famous UK newspaper The Guardian, the best pear type for poaching is Comice or Williams. The latter is more commonly called Bartlett in the US. Asian/apple pears have at least 16% more fiber by weight than other variety. For diets to lose weight, they are most likely the top choice. You will get more antioxidants with green pears and only slightly less fiber, so you can’t go wrong with those, either. Pears seem to have a laxative effect. Certainly for me.